Carbon monoxide kills 500 Americans every year; is your family safe from this deadly gas? Carbon monoxide (CO) is an odorless, colorless, and toxic gas. When inhaled, it replaces the oxygen in your body and accumulates rapidly in blood. Because it is impossible to see, taste, or smell the toxic fumes, CO can kill you before you are aware it is in your home. The effects of CO exposure can vary greatly from person to person depending on age, overall health, and the concentration and length of exposure. 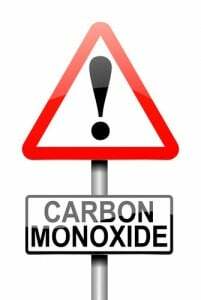 Carbon monoxide is produced in every appliance that uses combustion, including gas or oil furnaces, gas clothes dryers, gas ovens, gas water heaters, wood burning stoves, and fireplaces. Because of this, the danger of CO poisoning is present all year around, but is much more likely in the winter months. According to the Centers for Disease Control and Prevention, most CO poisoning deaths occur in January. When combustion appliances are functioning correctly and proper ventilation is present, there is nothing to worry about. The gas is harmlessly sent outside the home. To ensure proper conditions exist, have every combustion appliance checked annually. A professional can ensure that they are not releasing carbon monoxide indoors. Chimneys should be inspected every year as well. As a back-up to yearly maintenance, the U.S. Consumer Product Safety Commission recommends a CO alarm outside each sleeping area in every home.